This is a collection of the best travel agency WordPress themes designed for travel agents, tour operators, tour companies, package tour travel companies, vacation cruise companies, and other travel and tour operators. The themes allow you to easily and cheaply create a professional travel company website and list and showcase holiday, travel, cruise, tour, trek, and vacation packages that people can purchase online. If you’re a travel agent offering worldwide travel and holiday packages, or a small local tour company providing day trips and excursions in your city or local area you’ll find a suitable WordPress theme for your business below. Path Finder is a WordPress theme designed for travel agencies and travel related websites. It has a modern and professional design with a stylish dark color scheme and gold highlights. Path Finder is not a stand-alone theme but a purpose built skin for The Core theme. The Core is a really special multi-purpose WordPress theme from ThemeFuse. It’s a powerful and feature rich drag and drop WordPress theme that comes with 10+ purpose built child themes for specific industries. Trendy Travel is a flexible travel WordPress theme perfect for travel agencies, package tour companies, and tour operators. It could be used for hotels and resorts, cruise operators, hotel and travel directories, adventure travel operators and other travel businesses. The theme comes with custom posts for holiday packages and tour packages, custom details pages for hotels and places, advanced search and filtering for tours and packages, customized events calendar, WooCommerce support for packages, responsive Google maps and Google fonts, user ratings and reviews, integrated blog, gallery, mega menu system, unlimited layout and colour options, bbPress forum, powerful theme options, localization and WPML support, and more. The is built with HTML5 and CSS3 and had a full responsive design so it works on all screen sizes nd devices such as iPhone and Android. Voyage is a premium travel WordPress theme from Theme Fuse designed specifically for travel agency websites, travel companies and other holiday and vacation business websites. The theme has been created with amazing attention to detail and includes all the features and functionality you would need to build a professional travel business website to showcase tour packages, hotel packages, city break deals and more. It has a responsive design so all the elements scale and resize depending on the device the website is viewed on. It doesn’t matter if a visitor is viewing the website on a desktop computer, tablet or smartphone they will have an optimised viewing experience. Love Travel is a flexible WordPress theme designed for travel agency, tour operators, and travel blogs. You can use it for all services related to tourism such as hotels, resorts, honeymoon, cruise, travel and more The premium theme has a clean, modern and flat design using the 1200 px grid system with 12 columns. Its mobile friendly with a responsive layout so it adapts too work on all screen sizes and devices. The theme comes with a travels custom post type and associated template for your holidays / tour packages. It also has a custom search and filtering system so users can easily search by destination, price, season, type, duration etc for trips. Some of the other features of the theme include: a revolution slider, mega menu support, video sections, parallax and other effects, photo galleries, masonry blog with infinite scroll, shortcodes, WooCommerce and WPML plugin support, and more. Cousteau is a modern and professional travel theme for WordPress. The premium theme from cssigniter is specifically designed for travel agency, tour company, and other travel and leisure company websites. Cousteau includes some great travel business specific features and is mobile ready with a fully responsive layout based on the Bootstrap CSS framework. Some of the key features of the theme include: custom travel package taxonomies and templates (with itineraries, pricing, categorization, maps, videos and more), powerful custom search and filtering system (to easily find travel / tour packages), highly customisable (turn off taxonomies you don’t need, select their icons, layouts and more), drag and drop custom homepage layout, request more info” forms, special offers management, testimonials, custom widgets, shortcodes, itinerary dynamic custom fields, 20 pre-made colour schemes, theme options panel, localisation options and more. Fatherland is a WordPress theme created specifically for local tourism and travel agencies. 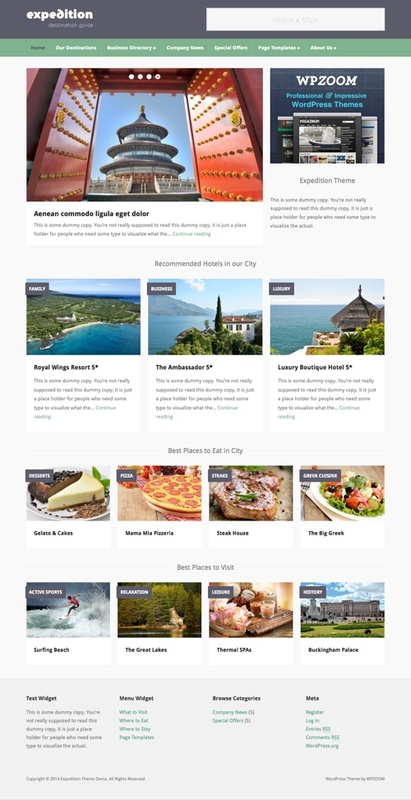 The premium theme has two core sub departments with associated templates for – excursions and guides. You can list as many tours / excursions as you like with descriptions, related information, images, galleries and meta box for tour information (type, guide, days, duration, meeting point, includes, price etc). Visitors can search and list excursions by region, guide, type etc. The Fatherland theme uses core WordPress functionality and there are no shortcodes, visual builders or other stuff like which is nice. That leaves you free to use your desired third party plugins for extra functionality. Some of the other notable features of the theme include: a responsive design that is lightweight, custom widgets and page templates, tour days meta box, weather forecast script, social links, translation ready and more. Viaje is a responsive WordPress theme created for travel agencies, tour companies and other travel destination websites. 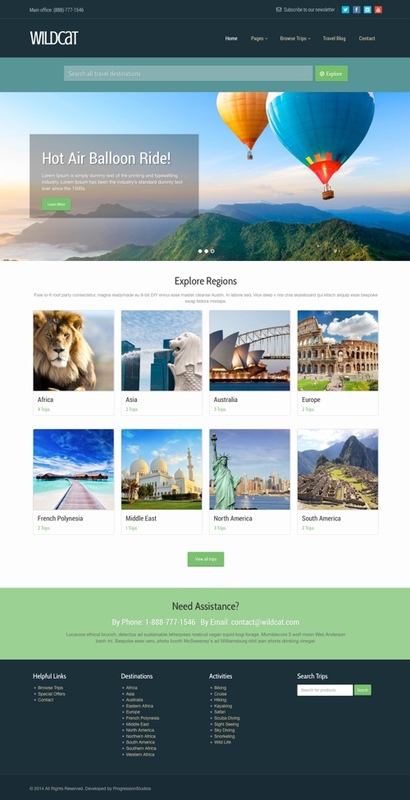 The premium theme has a unique that uses large featured images and backgrounds ideal for showcasing exotic travel destinations, adventures, tour packages, and cruises. Some of the key features of the theme include: a retina ready and mobile responsive layout, custom typography options, various custom shortcodes and widgets, admin options panel (to customize backgrounds, colours, fonts, page templates etc), translation and multi-language ready, and more. Book Your Travel is a responsive WordPress theme with online booking functionality ideal for travel agencies, tour companies, booking portals, hotels, resorts, and other travel business websites. The theme includes a functional booking system and lot of other advanced functionality required in a travel business website. It allows you to easily add tour information (set max number of people, price per person / child / group, create tour types, schedules etc), accommodation (set accommodation type, stars, facilities, address, website, check-in/out etc), room types, car hire, cruises (set cruise and cabin type, facilities, price, schedules), destinations (connects all the tours in the one place). Some of the other features include front end users reviews, custom made integrated booking system, 9 different colour schemes, advanced filtering system, availability checker, vacancies based on date, enhanced currency options, translation options and more. 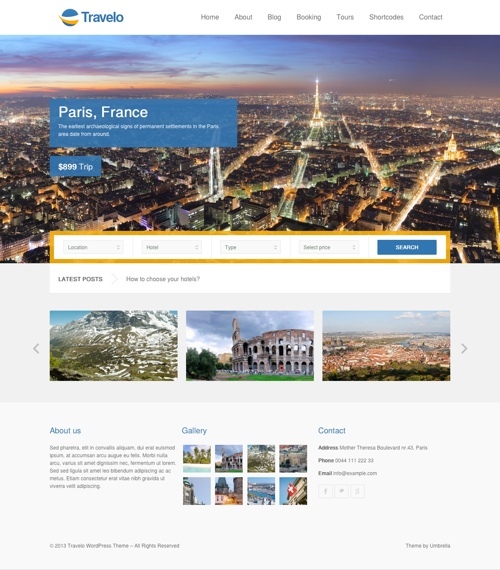 Travelo is a nice WordPress theme designed for travel agencies and tour companies. The premium theme has a clean and professional design with a homepage design that’s not too complex, but includes all the features in need in a travel agency website. Some of the key features of the theme include: a mobile friendly layout, tour management functions, advanced tour search, simple integrated booking system with booking form builder, reviews and ratings, sidebar options, sliders, translation ready and more. The Wildcat WordPress theme could be used for tour company and package tour travel websites. The theme has a professional looking design with a layout suitable for travel websites. It offers unlimited colour options, a mobile friendly responsive layout, ecommerce support, tour and travel package page templates, search and filtering options, unlimited sidebars, translations ready and more. Tour Package is a premium travel business WordPress theme designed specifically for tour and travel companies. It comes with a package post type and various template layouts which allow you to feature tour packages which visitors can easily browse and compare tour packages. Some of the other features include: WooCommerce support, a mobile friendly responsive design, unlimited colour schemes and sidebars, price tables, other custom post types (personnel, price, testimonials, gallery), Google fonts, custom logo / background / menus and more. Expedition is a responsive WordPress theme for travel and travel directory websites. The premium theme from WPZOOM would be ideal for travel agencies, travel and city guides, review websites and other types of niche travel websites. Some of the key features of the theme include: a dynamic homepage builder, homepage slideshow, directory page templates (3 or 4 columns), responsive layout, colour and font controls, built in banner ad management, HTML5 and CSS3 coding, custom shortcodes, various post and page layout options, custom background and logo, translation options and more. Magellan is a responsive WordPress theme designed for travel websites. The premium theme from Tesla Themes would work well for travel blogs, tour operators, travel agencies, travel booking websites and other travel related websites. The theme has a bold, sharp and modern design with a range of custom features and elements specifically for travel industry websites. Some of the notable features include: working order form, custom posts for tour pages (including reviews, gallery, location, weather, etc. ), beautiful animation and transition effects, custom posts and shortcodes, social media integration, Google maps, and WPML compatibility. Magellan is powerful Tesla Framework that allows you to easily customise the look and functionality of your theme without advanced coding knowledge. 30+ Best Travel WordPress Themes – collection of the best travel WordPress themes for travel businesses, travel blogs and travel magazines.